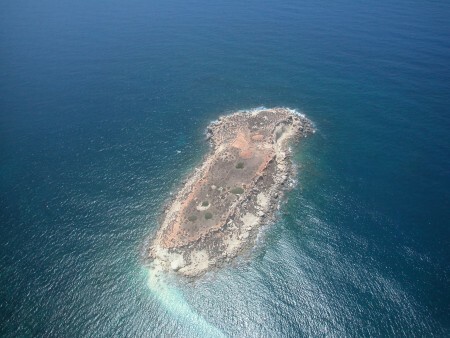 The Department of Antiquities, Ministry of Communications and Works, announces the completion of five weeks of excavation at the island of Geronisos, opposite Agios Georgios tis Pegeias, by the New York University Geronisos Island Expedition under the direction of Prof. Joan Breton Connelly. The team consisted of fourteen senior staff members and graduate and undergraduate students from New York University. Extensive evidence for monumental ashlar walls was revealed in a series of gypsum mortar setting beds for large stone blocks, most likely robbed out during the Early Byzantine period (6th - 7th century A.D.) for construction of the Christian basilicas across the way at Agios Georgios. Architect Richard Anderson continued his important work in plotting and drawing these features on a 3-D digital state plan that he is preparing with laser theodolite total station. Architectural discoveries made this season join those from earlier years to give an idea of just how much of the original surface of Geronisos has been lost to wind and sea erosion, undercutting the cliffs and causing widespread collapse of the island’s perimeter. Beddings for large walls end abruptly where the cliff faces have fallen away. A series of huge pithoi was recovered along the southern edge of Geronisos in an area where similar large vessels were found in earlier seasons. Many joins have been made between fragments recovered this year and pithos fragments unearthed in 2009 and 2010. These vast storage jars were probably used to collect much-needed rainwater for drinking on the island as Geronisos lacks a natural water source. Dr Paul Croft of the Lemba Archaeological Field Unit supervised excavations in the Central South Sector where a fine Hellenistic silt floor was unearthed. Quantities of Hellenistic bowls, jugs, and casseroles as well as amphorae fragments were found resting upon it. The floor was disturbed by a large robbing trench cut through for removing Hellenistic ashlar wall blocks in the Early Byzantine period. Professor Jolanta Mlynarczyk of the University of Warsaw continued her study of the Geronisos ceramics, a fascinating assemblage of imported and local fine and course ware pottery dating to the 1st century B.C. Drinking cups, bowls, juglets, lagynoi and plates in Eastern sigillata A, Cypriot Sigillata, and local Pink Powdery Ware have been unearthed within small rooms where ritual dining appears to have taken place during the final years of Ptolemaic Egyptian rule on Cyprus.